This enigmatic women's watch is brought to you by renowned fashion designer Michael Kors as part of their new Mini Lauryn collection and features an elegant 33mm gold plated round case and crystal set bezel. Beneath protective mineral glass lies the iridescent white Mother of Pearl dial, crystal set inner dial and intermitant gold Roman numeral hour markers. Gold plated three dauphine hands complete this striking watch face. 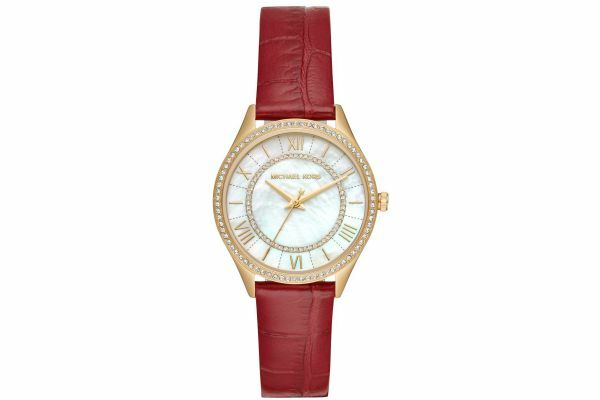 Set upon a rich red crocodile effect genuine leather strap and fastened by a secure gold plated buckle, the Mini Lauryn is the ideal watch for both formal and casual attire. Powered by Quartz movement and water resistant up to 50 meters, this stunning watch comes complete with a two year guarantee and official Michael Kors packaging. For us to size your new Michael Kors Mini Lauryn watch as accurately as possible, please take a look at our downloadable Watch Sizing Guide.